I have just bought a new DTR T2000 1TB to replace my Humax HDR 1000S. 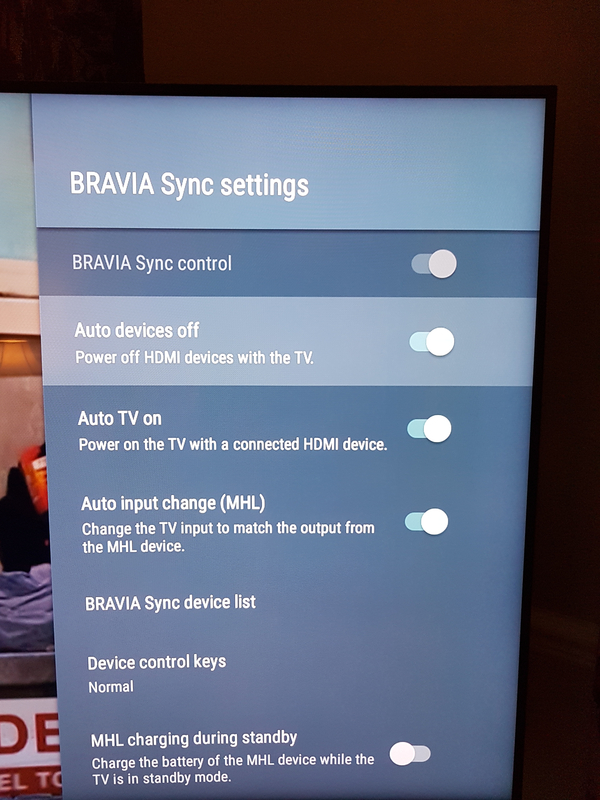 I am unable to get this new machine recognised in Bravia sync and therefore it does not switch the tv off also when switching the DTR on it does not automatically change the tv's input so I have to use two controls. I have exhausted conversations with Humax support, Who now point me to Youview support. I have tried every option found by googling for solutions to no avail. Humax confirm that it should be able to do what I want. Can you help or should I take this box back as being faulty? You don’t pair the devices for CEC (what Sony brand as BraviaSync) exactly; you put them in touch by connecting them with an HDMI cable, and let them sort it out. You should expect when you power the YouView box on, with the Sony TV in standby certainly, and possibly even when powered on with its own remote, that the TV will switch out of standby, if it is in that state, and will switch to the HDMI input the YouView box is on. You should not expect much after that; putting the TV back in standby will not put the YouView box in standby. And vice versa, though this Samsung TV does go back to the channel it was on before in these exact circumstances; though in different power-on scenarios, the TV will stay on the HDMI channel of the YouView box. I have seen some oddities; a T2000 YouView box that ‘got used to’ being on HDMI 3, when moved instead to HDMI 2, still insisted on switching to HDMI 3, possibly due to some over-optimisation or caching of old values. But by and large, you are not seeing the switch-on behaviours we both expect, but you are expecting switch-off behaviours that I would not expect, though both your recollection of how the T1000 behaved, and what Humax say, support your version of things, and not mine. neither of which have ever worked for me, the switch-on behaviour being a third thing not mandated anywhere, though the box would be a bit of a chocolate fireguard if it did not have this most fundamental CEC function. (Unless ‘playback starts’ is interpreted as ‘taken out of standby’, and not as ‘when you press play’). But the second item above certainly supports both your recollection of what your T1000 used to do, and what Humax say the box is supposed to do. Though I generally prefer that my box does not perform this function; and that if any other of my CEC devices perform it, it is not triggered by simply turning off that device. (Hmmm, maybe a long press does this? That would be OK; I must try it). Fortunately, the forum still has Dutchice and Kuschelmonster, both of whose knowledge is tremendous. Kuschelmonster, in particular, knows exactly and precisely all the shortcomings of these Android sets, and doesn’t think much of them, but ploughs on regardless. I guess when you have invested all that time and effort in learning Sony Android stuff, it’s hard to give these TVs up as a bad job. Do you why Quinnicus decided to leave both fora? Sorry, I didn't know you had replied until told today by youview support. Re. CEC v BraviaSync. Not sure what you mean. Pic 1 from my TV settings says that BraviaSync controls HDMI devices. Also you can see that my other devices are connected. (And these work properly) I can't get my Humax to show up here even though my old T1000 did. Picture 2 shows that "Auto devices off" powers off HDMI devices with the TV (and this also works on my other devices and my old T1000). I'm just a layman but this evidence, to me, points to the problem being the Humax not being recognised by Bravia sync. Thanks for the time you have taken with my problem. I wonder if you have any further thoughts given these screenshots or have I got it all wrong? P.S I tagged Quinnicus because I remember him being very knowledgeable when I first got this Android TV. I can also say that the TV has largely settled down and I can put up with it's now rare idiosyncrasies Having Android is far better than not having it as on my now boring Samsung smart TV. P.S I tagged Quinnicus because I remember him being very knowledgeable when I first got this Android TV. I can also say that the TV has largely settled down and I can put up with its now rare idiosyncrasies. Having Android is far better than not having it as on my now boring Samsung smart TV. There is a set of commands defined as CEC (Consumer Electronics Control) that are part of the HDMI specification. (NB: Tap/click the link embedded in that ‘CEC’ to read the Wikipedia article about it). Most manufacturers give this a proprietary name; Sony call it BraviaSync, as I mentioned in my reply above. But it is all CEC, or products of different makes could not interoperate. Wiring for CEC is mandatory in the HDMI spec, but providing, or supporting, any or all of the commands is not. And as your second screenshot shows, the Sony will support the Auto Off function, but you can turn it off if you want. But it is not a fault if a given pair of devices do not support certain CEC interactions, unless the manufacturers of both devices say they should, and one or both of them don’t. At which point, you have to determine who the culprit is/culprits are. Sarah, it would be very useful to have a definitive statement of what CEC interactions YouView boxes support; my YouView boxes will turn my TV on, but that is the only CEC interaction I have ever seen, from T1000, T2000, and T4000. If any of them can turn the TV off again, I would like to know how this can be achieved. The absence of Quinnicus is a great loss to the Sony forum. But he is gone now, alas. And choosing between the quirkfest that is Sony Android, with its pale shadow of YouView, and a proper YouView box feeding a boring (or predictable, reliable and straightforward, as we call them) Samsung Smart TV? Turning on your STB from active standby or deep standby to ON will turn your CEC enabled TV on (within 2 mins if booting STB from cold). With some combinations of STB and TV, the TV HDMI input will also switch to the right one, everything else not supported. None of the "turn off" functions are implemented. TV -> STB, or STB -> TV. Is your old box an HDR 1000S or a DTR T1000, or have you had both? I suspect that a Humax Freesat box might behave differently from a YouView box. My T2110 will switch on my Sony XE9005 but it doesnt’t switch the tv to the HDMI port that the T2110 is connected to. And neither powers off the other. All a bit hopeless compared to the relationship between Sony XE9005 and Apple TV 4K which seems to work perfectly. I also have a T2110, connected to a Panasonic plasma, couldn't tell you the model off the top of my head. I get random behaviour though; from TV standby, turning on the YouView always turns on the TV, but only occasionally will it switch to HDMI input. Given that my TV interacts as it should with all my equipment and even my old Humax, but not with my brand new Humax, I would suggest it is quite clear who the culprit is. Unfortunately Humax "Support" have ducked the issue and passed the buck to youview support. Thanks. Looks like two steps forward and one back when newer equipment have less functionality built in than older models. As to Humax in general, it is unlikely to be my next choice given that the competition all seem to be doing better. As as I tried to make clear above, there is no ‘culprit’ here. And nor is there any buck-passing going on - Humax built the box to YouView’s tight specification, with just the one CEC interaction, where the box tries to turn on the TV connected to it by HDMI, something almost universally achievable, and then select the input that HDMI cable is plugged into, a step which not every TV will support. As to Humax in general, it would be most unfair to penalise them over YouView’s limited CEC; as you yourself have described above, Humax can perfectly well bake a larger CEC feature set into those boxes where they have a free hand in the design. I know you're trying to help but it seems as clear as mud to me when a service provider (software or hardware) decide to not incorporate commonly expected features into their design. Here is a copy from Humax support saying that the little I am asking for should work. I think we all have our issues with the design of YouView, in various ways, but it is important to distinguish between a design decision, however infuriating, when a box doesn’t do what you want it to do, and a bug, when it doesn’t do what its manufacturer intended it to do. This is because the mechanisms for fixing these two things are so different, as is the likely level of manufacturer concern about them. As regards what Joseph said, Humax design the boxes and provide a layer of firmware, but YouView code sits over this, and the last word on what the box should and shouldn’t do rests with YouView, not Humax, and @Sarah, as one of YouView’s official representatives here has given us a more definitive description of the CEC functionality provided in the YouView boxes than Joseph of Humax could. I would also comment that Joseph speaks of CEC as an indivisible thing, and as if the power of it is entirely vested in one of the devices supporting CEC; and neither thing is true. Firstly, there are about 15 possible CEC behaviours, and how many of them, if indeed any at all, a single device offers is entirely an implementation decision for its designers. Secondly, a given CEC behaviour is only effective if both communicating devices support it. Hence, for instance, Sarah’s comment that a YouView box should turn on your TV when coming out of standby - because TVs almost universally support this CEC behaviour - and try to switch the TV to the HDMI channel the YouView box is on - which does not always work as not every TV supports this, even though the YouView box requests it. In our household we usually want the TV to stay on when the YouView box is switched off. A YouViews CEC won't switch a TV off. They only have the capability to turn them on. One of the issues with CEC is history; it’s a stateless thing that, on its own, does not know where it has been. i.e. who is the master and who is the slave? Which can get quite complex, and requires the TV to form and hold an opinion about whether or not it should obey a CEC switch-off request if it gets one. But often, popping the YouView box on to check something for an answer here, when the TV is in standby, I could wish that when I put the YouView box back in standby, the TV would go off again. Though our Samsung TV can negotiate that with the Sony Blu-ray player on HDMI 2 here, so it clearly has some CEC meta-smarts. (This Blu-ray player wakes up, whether I want it or not, by the mere fact of my choosing that HDMI port on the TV, though I suspect that this isn’t a CEC interaction). You get some strange things with CEC, though. Currently, I’m investigating the Amazon Firestick hanging off the Samsung’s One Connect box, which when started from the Samsung remote, by CEC, then only responds to the Samsung TV remote, and ignores its own, paired, Amazon remote. And In fact, I didn’t even get Amazon Video at first. Fine up to the point of choosing and starting something, but then all I got was a blank red screen, the red of RGB. A soft reset fixed this, though. The argument for an external device turning a TV on would seem to be stronger than the one for turning it off, particularly if the TV has several devices attached to it. With increased automation there is going to be little left for us to do, except for the physiotherapists trying to encourage us to take more exercise to prevent our disused limbs from withering. I used to imagine a future in which people with big thumbs would become dominant and we would evolve into a species with big thumbs and little bodies. Now, with voice control, I guess that we will stay pretty much as we are . I agree. None of my equipment turns the tv off, nor would I want it to. I wanted the tv to turn off the Humax, as it does with all my other equipment. Also to redirect the input to the Humax as happens with all my other equipment. However, somewhere between Humax and Youview the implementation of these basics seems to have got screwed up. I don't really care how complicated CEC is or whether it is dependant on all parties singing from the same hymn sheet. I just expect the simple basics to work. Roy seems to be trapped by his knowledge, and though he may mean well, it comes across as unhelpful. Thanks for your input. I've decided I can live with having to use two remotes. It was a little challenge trying to get this to work, but in the end, life's just too short. Keep up the good work. I've decided I can live with having to use two remotes. You will have to give me some tips on how you managed to get to get it down to just two . Just a footnote. My Pioneer Blue ray packed up this week. Bought a Sony replacement, plugged it in, no setting up. Out of the box it switched on the TV, grabbed it's input by the cahones and brought on the sound system. When I later switched off the TV it shut down the blue ray and sound system the way it should but i had to go find the Humax remote to shut off the only box left standing. Says it all to me! Yes; it says, perhaps, that you would swap your YouView box for a competitor that did everything you want in a heartbeat. But because there isn’t any such, you carry on with it. Like the people down the years for whom the lack of YouTube, the lack of padding, the lack of <insert app names here>, the lack of the latest version of <insert app names here>, the lack of DLNA, the lack of backup for your recorded programmes, the lack of the ability to watch your recorded programmes anywhere but on the box that recorded them, the lack of Lists, the mini-TV and a raft of features we took for granted when YouView went backwards to NextGen, and now the lack of HDR and whatever new technologies are coming down the pike, and the lack of <insert the no doubt many, many, lacks I have missed, including each user’s personal top gripe if not shown above> have caused them to cast around for each new Great Technical Hope, and then sadly dismiss it for this or that set of shortcomings that outweigh the shortcomings of the YouView box. I have reasonably consistent behaviour between my two systems, an old (2013) Sony Bravia with Youview T2000 - Youview switches TV on and switches to HDMI but only if the TV has been in standby for a couple of minutes. Switching off the TV doesn't switch off the Youview box and vice-versa, I can live with that. My other system is a newer Sony TV (2017), a Sony Blu-ray, a Sony AV surround sound system and the Youview box. These I control with a Logitech 680 universal remote. As they are all powered by an activity I don't have the same issue of powering items on/off, but the Youview box does switch to the correct HDMI port. 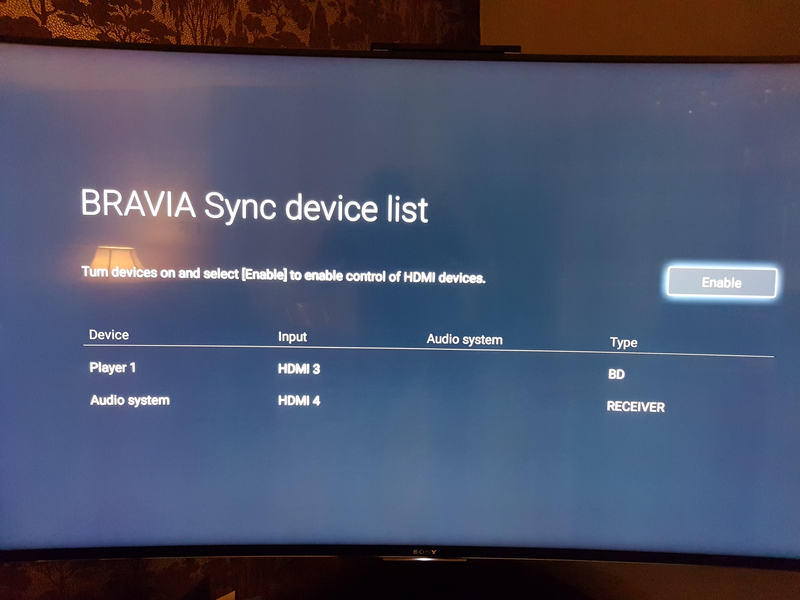 Trying to get CEC (or Bravia Sync in Sony parlance) across all of the boxes is fraught with difficulty, the Blu-Ray switches off the TV when I don't want it to, sometimes the AV system gets switched off, sometimes not etc. In the end I disabled most of this relying on the Logitech to come to the rescue. Not perfect every time but pretty consistent and easy to manipulate between 'activities' and 'devices'. I found the Logitech remote much simpler to programme and use than similar devices from All-for-One. The more that technology does for you, the more you find that it can't.